Morning suit There are 31 products. Frock coat of Italian tailoring with elegant cut Slim. Pinstriped fabric. The pinstriped fabric conveys safety and proper to a gentleman who likes formality in a day of celebration sobriety. Tuxedo complete this set of cross-matching vest society. It comes with bag garment bag Ottavio Nuccio Gala. 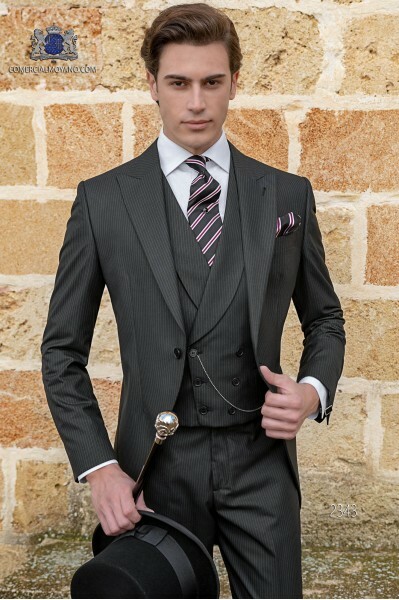 Black Italian morning suit with red pinstripe with peak lapel. Wool mix fabric. 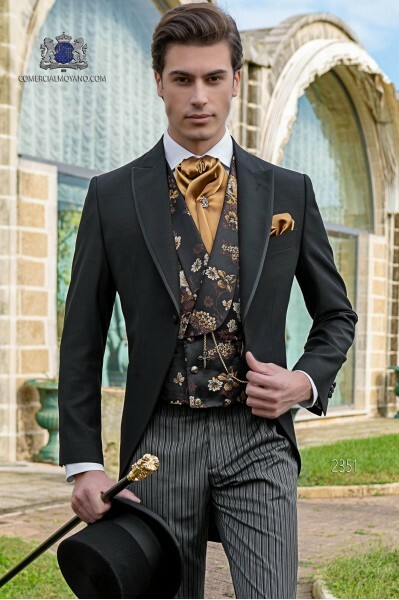 Tuxedo Wedding suit 2437 Gentleman Collection Ottavio Nuccio Gala. Coordinated with crossed vest of the same fabric, 6 buttons in pearl mother and shawl lapel. 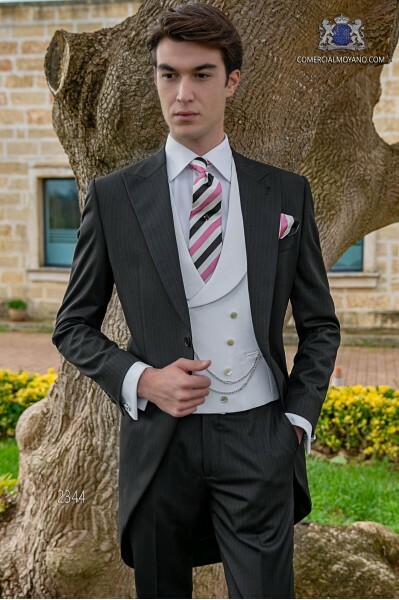 Italian bespoke wedding morning suit, in new performance black pinstripe, Tuxedo Wedding suit 2344 Ottavio Nuccio Gala, Gentleman collection. 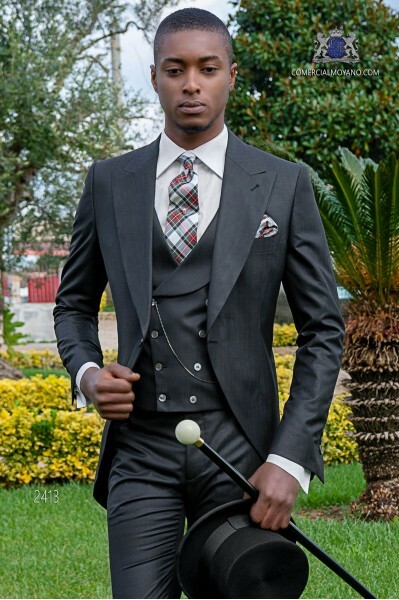 Italian morning suit wool mix black tailored suit with pinstripe trousers. Jacket with wide notch lapel. Wool mix fabric. 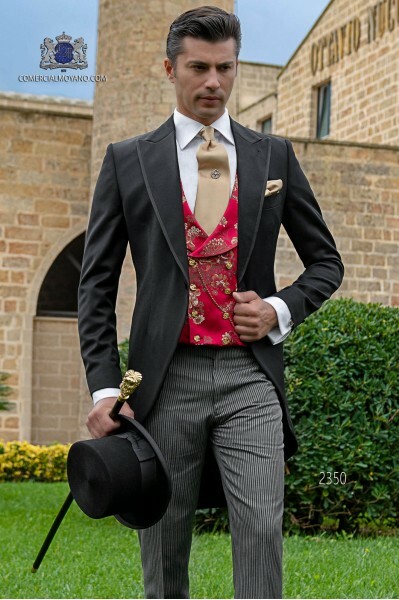 Tuxedo Wedding Suit 2350 Gentleman Collection Ottavio Nuccio Gala. Italian bespoke black morning suit with wide peak lapels, satin contrast and 1 covered button made of wool mix fabric. 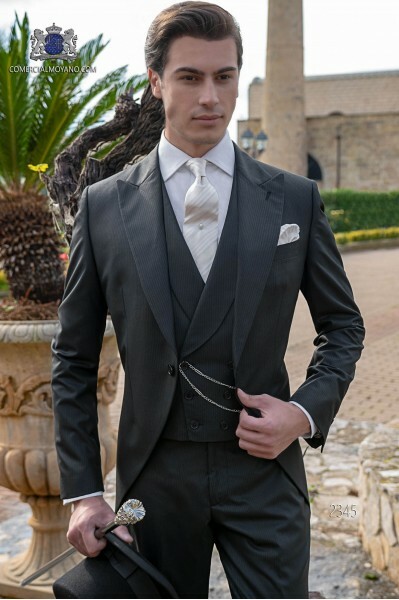 Tuxedo Wedding suit 2351 Gentleman Collection Ottavio Nuccio Gala. Italian bespoke black morning suit with wide peak lapels with flap tip with live in houndstooth and 1 button. Wool mix black fabric. 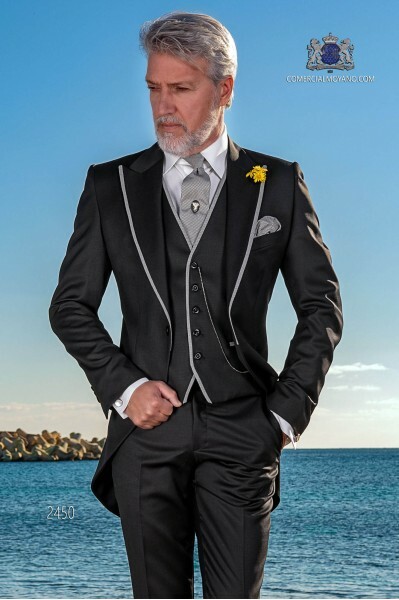 Tuxedo wedding suit 2450 Gentleman Collection Ottavio Nuccio Gala.